Following our first successful bid for national church funding in 2017 three key projects to grow the church on estates in Lancashire have been moving forward, writes Ronnie Semley, Diocesan Communications Manager. One of those projects is the new M:Power training centre at St James, Lower Darwen. M:Power has a remit to train future leaders for urban mission, both lay and ordained, and has already embarked on its training programme following the recent commissioning of the M:Power team. The M:Power model is not just a Diocesan-based initiative however; if successful it will be a model that could be replicated across The Church of England. The following article by Madeleine Davies appeared in the Church Times of March 8, 2019 and is reproduced here with permission. A COMMON refrain that Rev. Canon Tim Horobin has encountered in urban areas is the lament that no 'leaders' are to be found. It is a diagnosis that he has questioned ever since his ordination, 25 years ago. With the help of a share of a £1.54m grant from the Church Commissioners, and the support of the bishops of the Diocese of Blackburn, one such model is now under way. Fifteen people have been meeting weekly at M:Power, a 'school of urban leadership', at St James’s, Lower Darwen, where Tim serves as Vicar. The Bishop of Lancaster, Rt Rev. Dr Jill Duff, commissioned the team — which includes two urban evangelists, Sharon Collins and Rob McGibbon — last week. The top picture on this page shows Bishop Jill, left, with Rev. Canon Tim Horobin, second left, and Sharon Collins and Rob McGibbon. The aim of the school is to train new leaders 'in a way that equips and empowers and transforms them, without taking them out of their context' according to Tim. Jesus, he said, "transformed the disciples without taking them out of their context. . . Lots of training offered has scared urban people off, and it’s time to change the language and, practically, how we do it. We are seeing some leaders that probably wouldn’t be recognised in some places, maybe who society has put down." The first cohort of 15 is due to finish this May. Clergy in the diocese had been encouraged to recommend people, and 'all sorts of kinds' had joined, from the age of 23 up to the mid-50s, and across traditions, Tim reported. 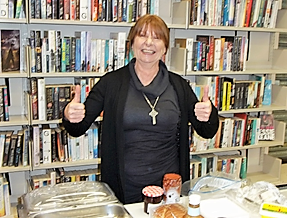 After a year-long apprenticeship at St Paul’s, Widnes, and training as a Reader, she joined M:Power and moved to the Roman Road estate in Lower Darwen, where she has established a church that meets in a community-run library, attended by 21 adults and five children, all new to faith. The Bishop of Burnley, the Rt Rev. Philip North, who has also played an important part in developing M:Power, has suggested that establishing a Christian presence on every estate 'might not necessarily mean a building' but 'a joyful, Christ-centred community of people who exist to serve and proclaim' (News, 28 September 2018). The fact that she lived on the estate was also important, she said. Among the community projects she is involved in is the planting of wildflowers and pathways in local woodland. Among the participants in the current cohort is Jason Clemson, pictured in discussion shot second from left, who grew up in an Anglo-Catholic church. He describes the course as 'absolutely amazing — it’s given me a deeper faith and understanding in the scriptures'. Currently working as the sales director of his own business, he has helped to established a new church in a school: the first session was attended by 150 people. He is currently in the discernment process with the diocese’s Director of Vocations, Rev. Nick McKee. 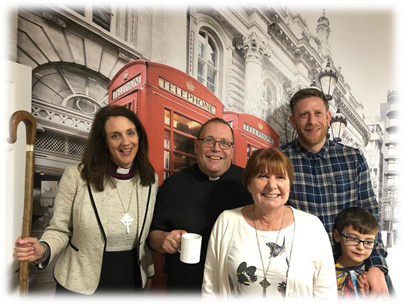 Bishop Jill said that M:Power was calling out urban leaders in Lancashire who, as described in Isaiah 61, would 'renew rebuild and restore the ancient ruins'.